These signs bring to life the memories and products of times past. Our collection of handmade porcelain signs are authentic reproductions using the same process popularized in the early 1900s. Porcelain signs have been said to be a true visual reflection of the times. When used for advertising, the signs gave a brilliant permanence to the product. 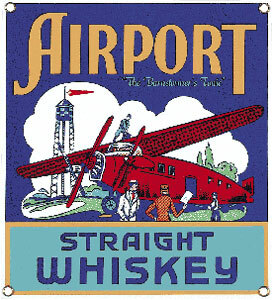 Today these advertising signs are a collectible art form. The colors are not paints but finely ground glass crystals which, when kiln fired at 1350 degrees, fuse to the heavy steel plate. Each color is applied and fired separately, creating a durable, lustrous and rust resistant product. The resulting high quality and excellent craftsmanship assures a great personal decorating piece or beautiful gift! Size: 8 3/8 inches x 9 5/16 inches.